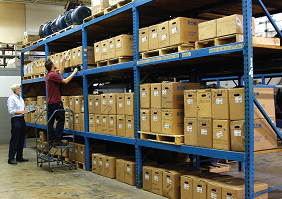 Since 1958, RHM has provided its customers with strong local inventories. Our multi-million dollar Michigan inventory of fluid power products includes literally thousands of pumps, valves, filters, compressors, manifolds and accessory items. By way of example, for Eaton Vickers alone, we have over 400 pumps and 2,500 valves on the shelf and ready for delivery! If RHM does not have it on the shelf, we have 24/7 nationwide access to a vast distributor network facilitated through a service called Warehouse Two. With this resource, RHM can scan inventories around the country for product lines including Eaton, Sun, Char-Lynn, Daman, Bijur Delimon, Vickers, Hawe and Schroeder. If we still can’t find it for you, we’ll do a product conversion or come up with a design around using a similar (but available) product. Should you have recurring needs for certain products, RHM will of course work up a stocking program to ensure smooth product flow.